She purchased a striped swing dress WITH POCKETS. Its amazing how pockets make women SO happy. 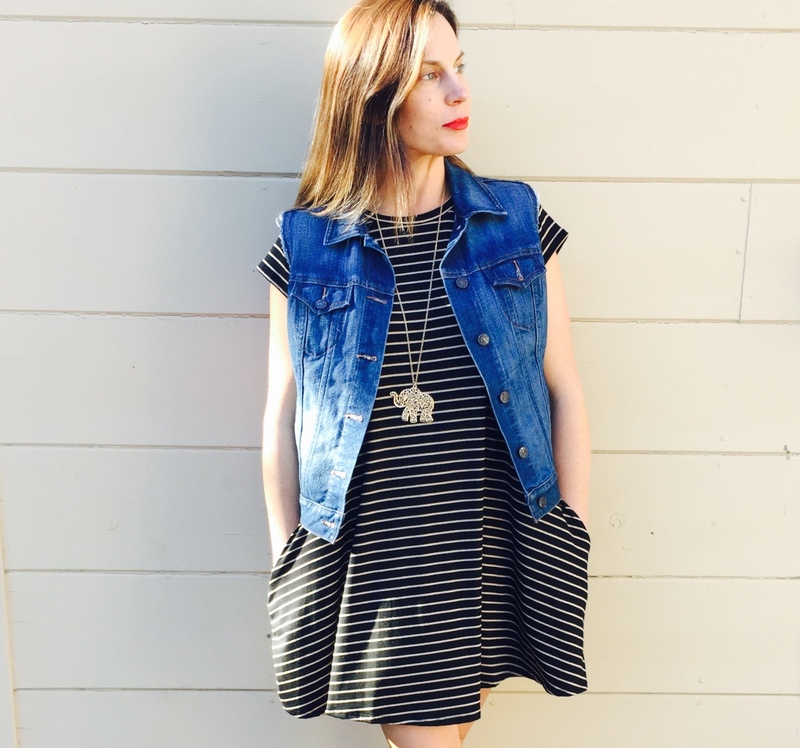 By adding a fun long pendant necklace and a staple denim vest, she has turned this dress into casual chic. Throw on some summer wedges or tennies (tennis shoes), and make this uber comfortable dress even more casual. And guess what…. she also got in in black……… (roll next photo). SIMILAR DRESS from Amour Vert (huge fan of this brand) at Nordstrom Rack. The same Swing Dress from Nordstrom Rack in Black. Same fabulous pockets! SIMILAR DRESS with a cold shoulder detail. I added a velvet choker to really amp up the edginess of this outfit. 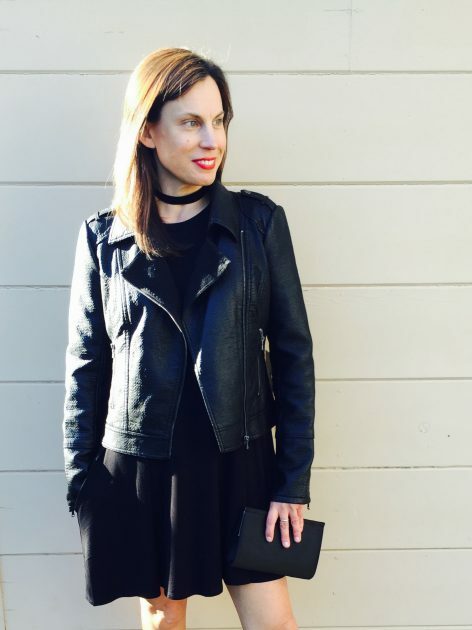 And how about this Vegan Leather jacket? I love the raffia texture. SIMILAR HERE. Insert margarita and call this girl a cab for a night on the town! Now let’s take the same dress and turn a casual take to it. I’ve played with belting it over some skinny jeans. A fitted jean will balance out the flowiness of the dress. And this belt will define her fabulous waist allowing a more polished look. We threw on some fun black wedges from Tom’s. These Tom’s wedges were purhcased last summer and I think are such a fabulous staple moving forward. 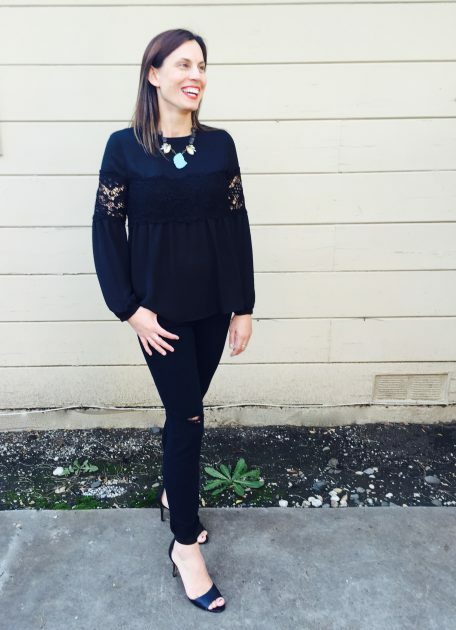 And since we pulled them into so many outfits for this post, I have found SIMILAR HERE of under $80 at Nordstrom. Love Love Love this pretty lace-detailed flowy top. The ruffled sleeves are a perfect finishing touch. 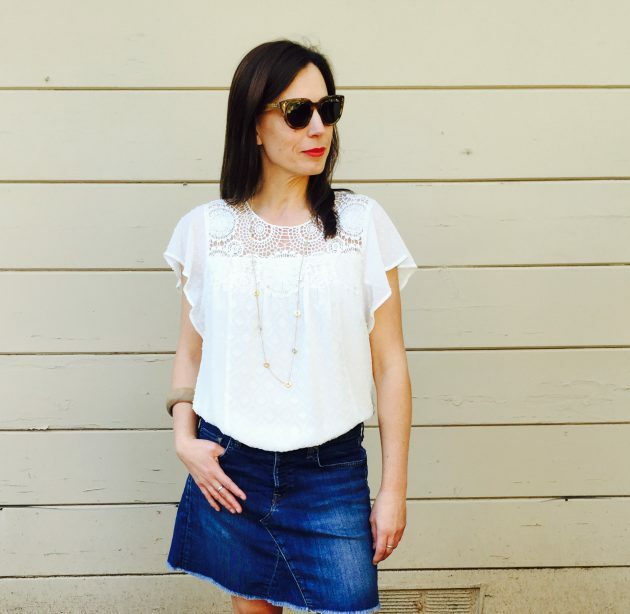 With a denim skirt, that every woman SHOULD have in her closet for Spring/Summer, this outfit is going to keep her cool as a cucumber on errands with her four little cherubs! She can dress this top up for night with some skinny jeans and heels, and perhaps add that vegan leather jacket, shown earlier, for a nighttime layer. This two -piece jogger/sweater combination is THE MOST comfortable item in her closet. She also purchased these easy Converse Chucks in a muted metallic grey and I just know that she will get a tonne of wear out of them in the summer months. So easy to throw in the wash. SIMILAR HERE. I think this outfit is all about cool comfort, and can be tweaked by swapping out the hoodie for a cool and casual slogan tee. To amp it up, add some fun beads and some wooden bracelets! Another item purchased here were these distressed Hudson jeans in black. 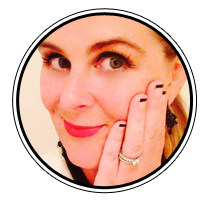 In the next few pics I am showing how you can dress them up from day to night to really make the most of them in you wardrobe. She has thrown on her freshly purchased striped tee (also purchased in black), and tied her staple chambray shirt around her waist. SIMILAR HERE. And there are those fabulous Converse tennies again. 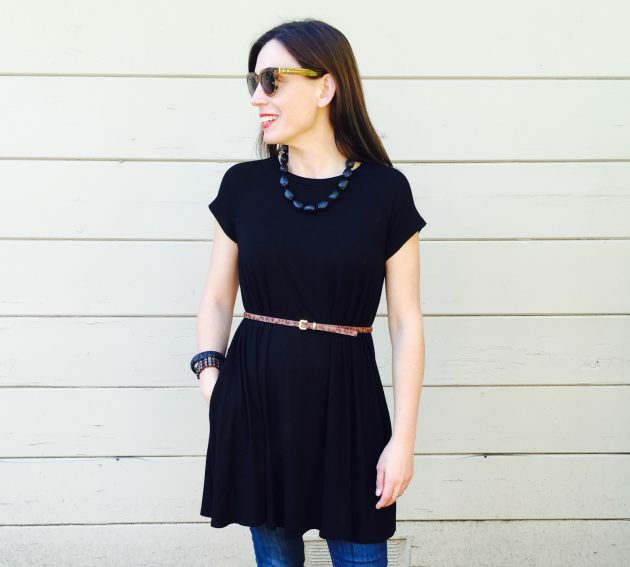 Add a bright long necklace to finish off the look. Now I have dressed up the distressed jeans for a fun night time look. I love how these items are opposite but work together. Edgy structured denim meets flowy feminine top. Opposites really do attract! The racer back detail is such a beautiful finish, and I love this jeweled purple with her brown locks. Another night time look! 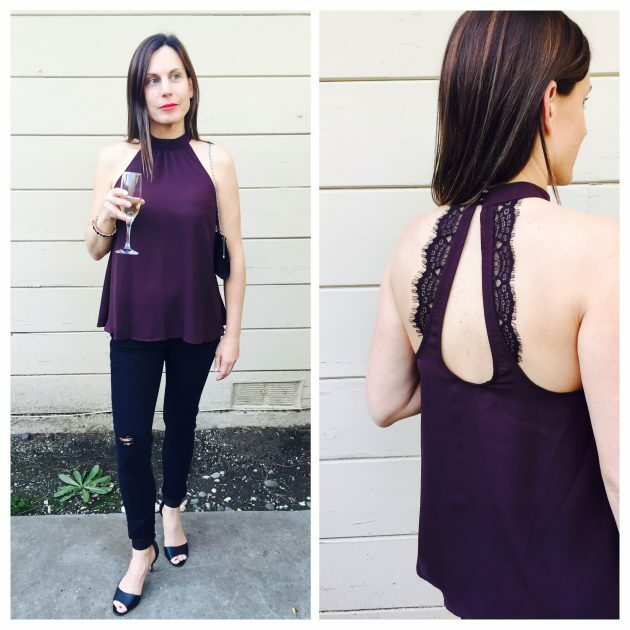 She purchased this black top with beautiful lace details across the upper arms and continuing along the bust. By adding this turquoise necklace from her existing wardrobe, we have added a some color and interest. This really is a gorgeous knock out top on her and she looks happy, right! 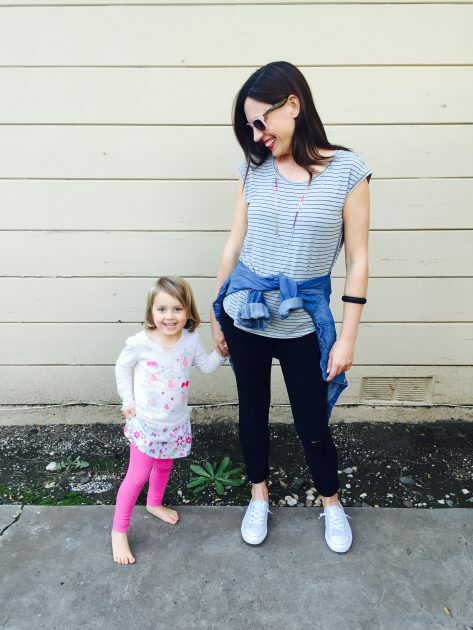 So much fun to style this awesome mama. « Which stripes for which type (body)? The model is adorable and gorgeous. The stylist is more than crazy talented, she is gifted and amazingly creative.